By 18, Mel Stevens was working as a professional dancer, opening department stores in Oxford Street, on TV commercials and Breakfast TV, music videos and touring with top bands worldwide. By 20, she was working for a major record company and continuing to dance professionally the world over. Her momentum was halted in 2003 by the tragedy of breaking her back while giving birth. The incident forced her to relearn everything she had known, physically and emotionally. While coming to terms with her altered physical state, declining health and the effects of pain medication, Mel had to adjust to the trappings of life with paralysis. [read more=More less=Less]Then came an offer to a disabled day centre 2008 which happened to be next to Newbury College. Deciding she’d much rather go to college, Mel studied sports, coaching and working with children in her quest to understand her own body and find life again. A chance invitation to a West End show in 2012 thanks to her old agent allowed her to meet her past modelling booker who was working with a disabled theatre company. Next, Mel was in contact with the producer. The project was inspired by the run up to the Paralympic ceremonies, where Mel first performed with Graeae in aerial show ‘Prometheus Awakes’ for the Greenwhich and Docklands Festival June 2012. This event was the world premier of mass flying disabled artists prior to the ceremonies. The Paralympic aerial legacy intensive gave Mel the opportunity to experiment, play and fly. The experience was transformative, with the aerial harnesses and trapeze allowing Mel to use her powerful upper body no longer supported by her legs. 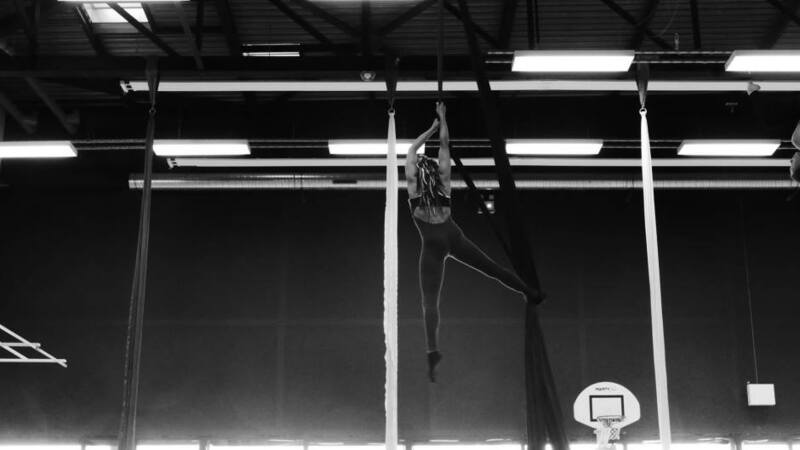 In 2013 an aerial teacher from the Paralympic project ran a week long workshop where Mel met Serenity Smith Forchion (a master teacher of aerial and circus skills and creative director of circus tours). The experience marked a turning point in which Mel realised that the project should keep going.